Our high quality and heavy duty forklift ramps will help you take your facility and your entire operation to the next level with increased efficiency and productivity, as well as dependable and safe operation at all times. Copperloy has over 60 years of experience producing yard ramps of all kinds, and with our in-house engineering team and manufacturing facility, we can produce custom forklift yard ramps to meet your specific needs. Whatever you’re looking for, we’ll help you get the job done quickly, easily and reliably. 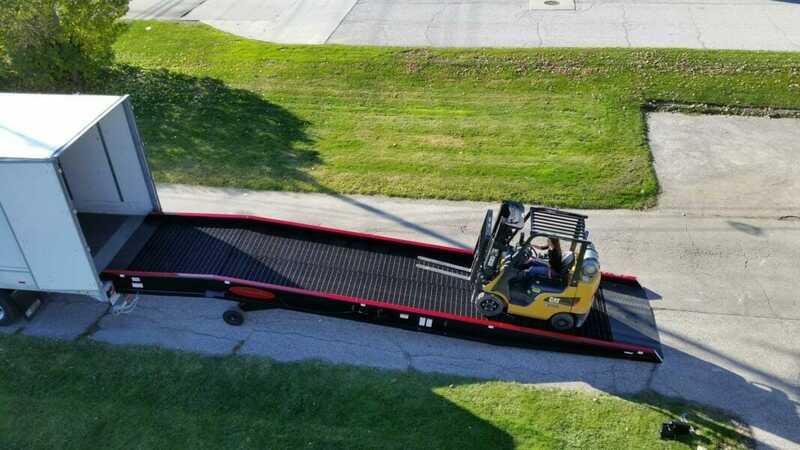 Unsure about the weight capacity or size of the ramps you need? We’ll be happy to help you find a solution based on the weight of the equipment you utilize, the loads you carry, and the specifications of the facility you utilize. Weight capacities of 16,000 to 35,000 lbs. Our dock ramps for forklifts are made from steel or aluminum, and they feature steel grating for reliable traction to ensure worker safety. Whether you buy used or new, our mobile ramps will provide the convenience you need to handle loads more efficiently at your facility’s loading dock. You have a choice of widths between 70, 84 or 96 inches, and capacities between 16,000 and 35,000 lbs. 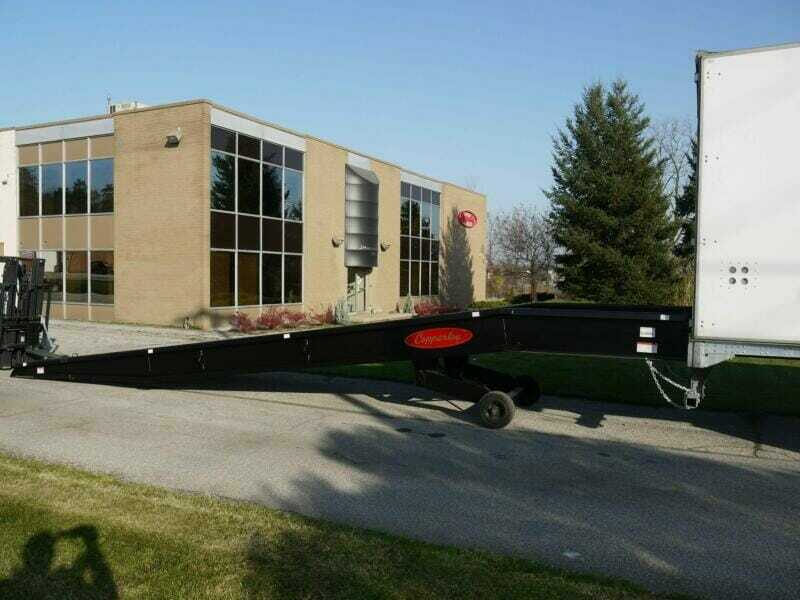 On our 30-foot forklift trailer ramps, the height range is between 38 and 60 inches. How do I know what capacity mobile ramp I need? You can determine the capacity of ramp needed by adding together the total weight of the fork truck and the max load the fork truck carries. Our standard capacities are 16,000 lbs. and 20,000 lbs.. Larger capacities are available. What are the sizes of the curbs on the mobile yard ramp? The curbs on the mobile yard ramp 4″ wide and 7″ high. How fast can I get a mobile yard ramp? We stock our 16k and 20k mobile ramp models, which can be ready within a few days. Depending on other models, it can be one to three weeks. Why are standard mobile yard ramps 84″ wide? Mobile yard ramp are 84″ wide because that way we can guarantee the ramp will fit into the back of a trailer. What is the useable width on a mobile yard ramp? The usable width on a mobile yard ramp is 76″ in between the curbs. Why should I purchase a Copperloy yard ramp vs. a competitor’s ramp? Copperloy ramps are made in the USA in Twinsburg, Ohio. The undercarriage of the mobile ramp is maintenance free. The ramp only has one cylinder and one hose from the cylinder to the pump. The pump is on the outside of the ramp, which makes it easily accessible. Copperloy uses A572-50 high strength steel on all mobile ramps. Above all, we care you get the correct product to deliver safe and efficient results for your loading and unloading needs. Find more answers to common yard ramp questions on our yard ramp resources page or wikipedia.